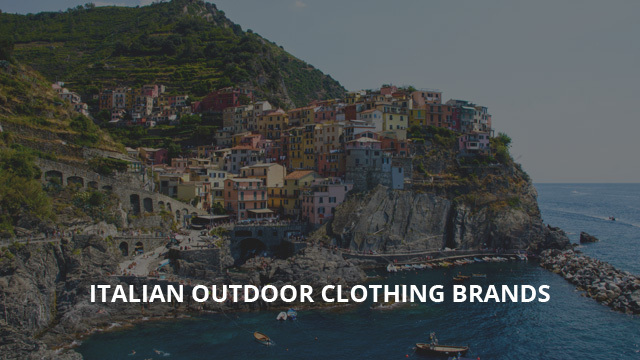 It’s been quite a while since our latest selection of European sportswear brands and today we are back with a new selection of 8 Italian brands, which design and manufacture sportswear, ranging from light outdoor tops, to specialized clothing and footwear. Italy is arguably the world’s main fashion center, as some of the most renowned brands worldwide that we all know and love are from this country: Gucci, Versace, Valentino, Dolce & Gabbana and many others. Since we went through several Scandinavian brands and covered some of the largest countries of Northern Europe, we thought to change things up a bit and move a little south, hence why we chose Italy as today’s country. The clothing brands chosen today are once again with a focus on sports, as we mentioned previously, and we are certain that you may have come across some of them. Let’s get started right away with Fila, a world-renowned Italian brand, which is currently owned and managed from South Korea. Despite it no longer being considered Italian per se, since in 2007 it was acquired by Fila Korea, it is still one of the oldest sportswear brands created in Italy and that’s why we have included it in this selection. Fila was established in 1911 in Coggiola by the Fila brothers, who originally made clothing and equipment for mountaineering. As the years went by, they expanded the product range by working on other sportswear and outdoor clothing, finally being established as a proper sportswear brand in 1970, when they began designing tennis apparel. Nowadays, the brand is not solely limited to sportswear as they also design, manufacture and sell their own fashion apparel, which has its roots in comfortable sportive clothing, but is very fashionable and stylish. Their designs include different tops and bottoms, as well as underwear and clothes specifically for tennis wear, including designs for children, too. Macron was founded nearly 50 years ago, in 1971 in Crespellano, Bologna. This brand is mostly known for its teamwear sports clothing line, as they provide teamwear to different professional football teams, since 2001. Not only that, but they also supply professional sportswear to teams and athletes from a variety of sports, such as Rugby, Weightlifting, Handball, Volleyball, Basketball, etc. Those of you who are outdoor lovers or are simply looking for some top-quality outdoor wear can find a variety of different options, which will really take your outdoor experience to the next level. Macron is not considered as a top brand when it comes to active wear for nothing, after all! Lotto Sport Italia started out as a footwear brand in 1973, in Montebelluna, Treviso. While they did at first retail sports footwear, their product designs quickly expanded by including sportswear, too. The brand quickly grew in popularity due to the quality of their designs, and it became a favorite brand of champion athletes such as Tonino Zugarelli, Andriy Shevchenko, Martina Navratilova, John Newcombe and many other football and tennis players. Around the 1980s, Lotto Sport Italia began its worldwide journey as it reached more than 60 different countries all around the globe. One of their most renowned and also considered to be one of the best products in the country is the Lotto Zhero Gravity VII 200 football shoe. 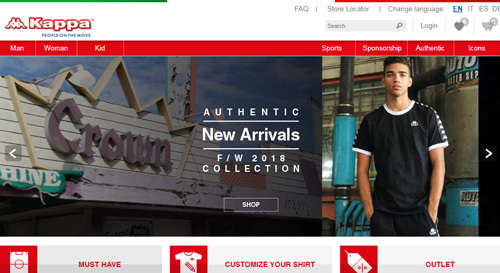 The product range that you can find on their website includes options for men, women and youngsters, which include sports and football shoes, as well as different sports apparel for a variety of both outdoor activities, as well as professional sports. This next brand is another popular Italian brand, with worldwide recognition due to their stylish sportive wear. Kappa‘s story begins in 1916, in Turin, as a firm that manufactured socks, which then later went on to become Kappa in 1967. While their clothing designs are aimed at sports and similar activities, a lot of the sales come from people who enjoy the “outdoor” fashion style (think rappers, for example). Apart from that, much like a majority of Italian sports brands, Kappa, too, is affiliated with different athletes and sports teams, the most recent one being the Alfa Romeo Sauber Formula 1 Team‘s official clothing supplier. You can find Kappa football wear in many different football clubs all over the world, as well as Volleyball, Rugby, Rowing, Ice Hockey, Boxing, Baseball and Skiing teams. This is a more pricey brand, but still quite affordable considering the high quality and high performance of the products. Diadora was founded in 1948 and currently manufactures sportswear and footwear for a wide variety of sports, including running, tennis, rugby, cycling and football. The original product was an artisan mountain boot and then moved on to other types of specialized athletic shoes, such as those made for football and then running. Through the involvement with different athletes and sports figures, the brand quickly grew in popularity and reputation as many other people were getting to know their products and work ethics. What’s very interesting about this brand is its intensive innovative work and research, mainly through the Diadora Research Centre, in which specialists, doctors and technicians came together to design some of the best shoes available in the market of athletic footwear. A look through their product collections shows a multitude of designs and types of outdoor clothing, including sweatshirts, hoodies, pants, jackets, shirts and of course, shoes, with options for all ages and genders. Legea was founded nearly 30 years ago, in the 1990s, but its story actually begins much earlier, around 1966 in Pompei. It firstly started out with the intention of establishing itself in the football market of the country and it achieved that quite quickly. Their products are a bit more specific than those of other outdoor and sportswear as they are designed mainly as football wear. This is not just a brand where you can get bits and parts of an outfit. They have compiled some of their products into sets, so that you can order everything at once, including shoes, socks, short and longwear for different sports, jackets and even a carrying bag for practicality. Through their website you can find not just a multitude of different sportswear for specific sports, but also apparel for different weather conditions. Legea is mostly affiliated with Basketball club teams and during the 2010 FIFA World Cup it was the official sponsor of the North Korean football team. Sergio Tacchini is another renowned sportswear brand, which was founded in 1966 by Sergio Tacchini, an Italian Champion tennis player, after he retired from the sport. The concept for this brand was simple: to add some color to tennis, a sport where the color white was practically the only option for tennis wear. Around the 90s, the brand took upon itself to vastly expand its product range by including shoes for athletic and leisure wear, as well as apparel for different sports, such as skiing, sailing and others. Accessories were also introduced in later years, and you may be familiar with the brand’s bags and perfume range, as well as smaller accessories such as socks, watches and also underwear. Staying true to its roots, the brand now sponsors individual tennis players and has done so for decades. The product range of today includes tennis-specific clothing and other designs for different outdoor activities and sports, with options for both men and women. The 8th and final brand for today’s selection is Erreà, founded in 1988. It is a brand that manufactures its clothes in Italy and which takes pride in the arduous and detailed process of their production line. Erreà is the first Italian brand to have been certified as per the Oeko-Tex standard, which guarantees that the textiles and products used by the brand are free of harmful chemicals. This brand is also the official teamwear brand of the Italian national volleyball team of men and that of women. Erreà takes a more technical approach to their designs, creating active wear clothes that can be worn by professionals and outdoor explorers alike.